You don't need six figures to buy a super limousine. 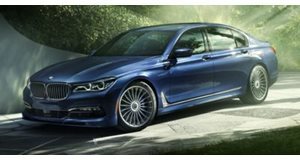 Along with a facelifted 2020 BMW 7 Series, Alpina recently revealed its updated B7 xDrive sedan, which will be sold in the United States. Like the standard 7 Series, the 2020 B7 features a revised front end and a wealth of other improvements. Power comes from a tuned version of BMW's 4.4-liter twin-turbo V8 producing 600 horsepower and 590 lb-ft of torque. With such massive output from the V8, the B7 can hit 60 mph in just 3.5 seconds and reach a top speed of 205 mph, making it one of the fastest sedans ever produced. Such a car seems worth its $141,700 starting price but what if you simply didn't have this hefty amount in your bank account? We have picked out seven used super limousines which can all be purchased for far less than the price of a new Alpina B7. Alpina BMW models are extremely rare in the US but it doesn't mean they don't depreciate like other luxury cars. If you are willing to buy an Alpina B7 from just two generations ago, you could save a fortune. The F01 and F02 generation B7 models were sold in the US from 2012 to 2015 and can now be found ranging from around $25,000 to $60,000. Like the brand-new car, this generation B7 is powered by a 4.4-liter twin-turbo V8 producing 540 hp and 538 lb-ft of torque sent to the rear or all four wheels. 0-60 mph takes just 4.2 seconds and the top speed is a still-impressive 194 mph. Alpina isn't the only bespoke German luxury automaker on this list. For well under $100,000, there are a wealth of specially-tuned Mercedes S-Class models on the used market. We even found the ultra-luxurious Mercedes-Maybach S600 starting at around $70,000. This super limousine is powered by a 6.0-liter twin-turbo V12 producing 523 hp and 612 lb-ft of torque, which can all be enjoyed from a reclining chair in the second row. If you are more into performance than ultimate luxury, we also found a few examples of the S65 AMG starting at around $85,000. In this application, AMG was able to extract 621 hp and 738 lb-ft of torque, which is sent exclusively to the rear wheels. 0-60 mph takes just 4.2 seconds and the top speed is 186 mph. Before the Maybach badge was used as Mercedes trim level, it was its own Rolls-Royce-rivaling brand. These cars were among the most luxurious cars in the world but have now depreciated massively. We found examples of the Maybach Type 57 starting at around $60,000. The Type 57 debuted with a 5.5-liter twin-turbo V12 producing 550 hp and 663 lb-ft of torque but the later Type 57 S used a larger 6.0-liter V12 producing up to 640 hp and 738 lb-ft of torque. Just as BMW has never built an M version of the 7 Series, Audi has never built an RS version of the A8. The wickedly-fast Audi S8 will have to do. A new S8 is likely in the works but the outgoing third-generation D4 model is still impressive. Power comes from a 4.0-liter twin-turbo V8 generation with 520 hp and 481 lb-ft of torque, although these numbers may have been underrated as many outlets tested the car at just 3.5 seconds to 60 mph. Audi later upped the output to 600 hp in the S8 Plus and the 0-60 mph time dropped even further to 3.3 seconds. High mileage examples can now be found starting at around $30,000. The large sedan category isn't always known for being enthusiast friendly but the Jaguar XJR has long been one of the best driver's cars in the segment. The most recent XJR is powered by a 5.0-liter supercharged V8 producing 550 hp. Jaguar has also introduced a more powerful version called the XJR 575, which produces, you guessed it, 575 hp. The sprint to 60 mph takes just 4.4 seconds and the top speed is an impressive 182 mph. You won't be able to find an XJR 575 for under $100,000 but you can find a standard model starting at under $35,000. While all of the cars on this list are spectacular, some stand above the rest. It may not match the Alpina on comfort or interior volume but the Aston Martin Rapide is hands down the prettiest car on this list. The original Rapide is powered by a 5.9-liter V12 producing 470 hp and 443 lb-ft of torque. Although its 0-60 mph time of 5.2 seconds is relatively pedestrian, the top speed is an impressive 188 mph. The Rapide also sounds superb thanks to its naturally aspirated engine. Even though it bears one of the most prestigious badges on this list, used examples can be found for less than $50,000. We wanted to save the best for last. It's difficult to believe that a 2011 Bentley Mulsanne can be found for just under $100,000. It is by no means the cheapest car here but it does seem worthy of the price tag. Power comes from a 6.75-liter twin-turbo V8 pumping out 505 hp and 762 lb-ft of torque. This nearly 6,000-pound behemoth needs just 4.8 seconds to hit 60 mph and can reach a top speed of 184 mph.